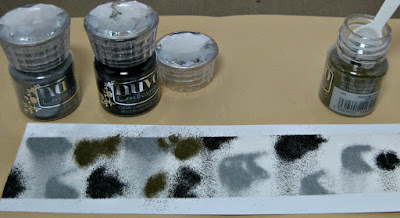 It’s my turn to post a Tonic Studios project on my blog and at the new Tonic USA blog, and I am sharing a Kensington Handbag gift card holder and a new embossing powder technique I have discovered. I have to say I absolutely love this new Kensington Handbag die set from Tonic Studios! It is just perfect for a small gift like a gift card or for a decoration at a bridal shower or friend’s gathering. I started by cutting out the main purse and side piece dies out of textured black cardstock and one of the front side pieces as well. I embossed the front piece in the Rosalyn Forever Moments A4 embossing folder and then rubbed Nuvo Indian Gold Embellishment Mousse over it for the lovely gold and black roses background. 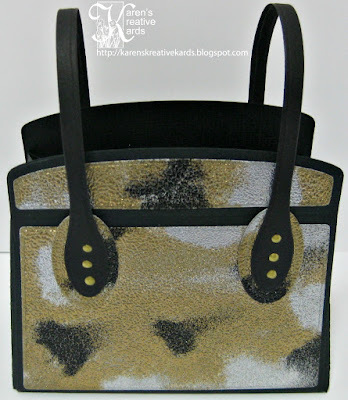 I discovered a new technique using Nuvo embossing powders recently and I made the back, top and purse handle ovals with my Metallic Camo technique. I have never seen this idea on Pinterest, in stamping magazines or on any of the blogs I follow so I think it is original. If you have seen it elsewhere or done it yourself, let me know so I can give proper credit. I shared some hints of this technique on my blog and one of my brilliant followers suggested it looks like camouflage, so I named it Metallic Camo Technique. 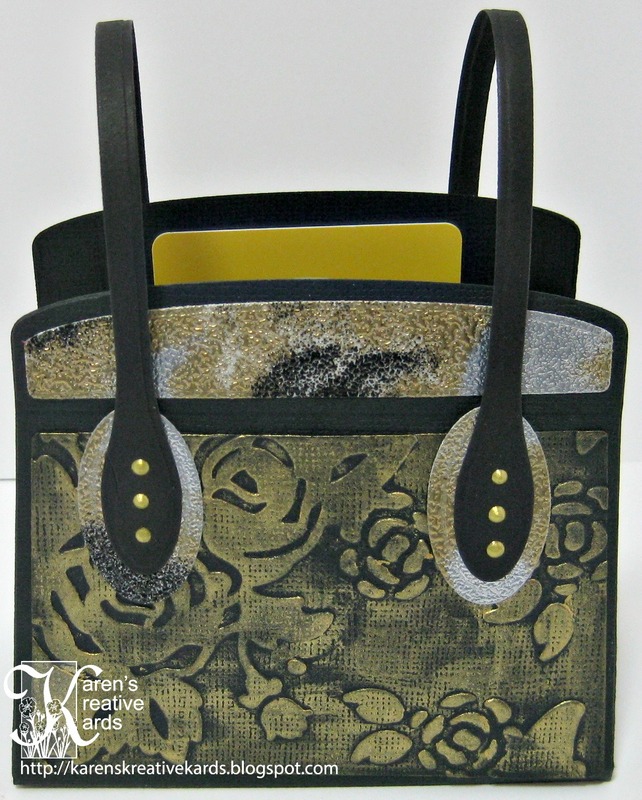 I die cut the top, back and purse handle ovals out of these textured embossed pieces. I die cut the purse handles out of black cardstock and attached to the textured ovals with strong two sided tape. I added 3 perfect self-leveling drops of Bright Gold Crystal Drops to each purse handle. I wanted to use this beautiful purse to give a gift card to a friend, so I added one more strip of the Metallic Camo to the inside to hold the gift card in place. 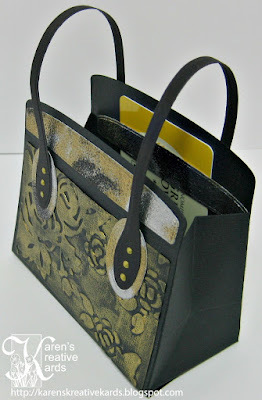 I love how this Kensington Handbag gift card holder turned out and hope it has inspired you to try making one yourself. Be sure to subscribe to the Tonic U.S.A. blog here or follow us on Facebook here to see what the rest of the Tonic U.S.A. design team members make with this die and others. absolutely gorgeous!! 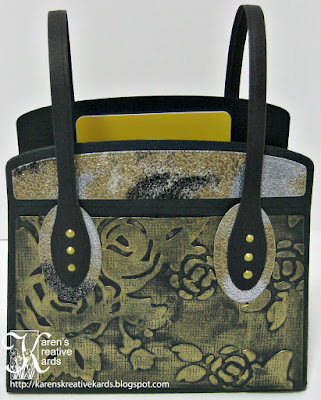 great use for embossing powder and the purse is so cute! I am a new follower, thanks for stopping by my blog and following! What an adorable gift card holder. The holder itself is a special gift. Love the Mettalic Camo. I haven't tried it yet. Wow, what a cool project! Wowzer!! Really love this cool technique and your purse looks great!! Truly a work of art. I love your handbag design! I love your purse project and the technique you discovered. Gorgeous!! WOW!!! Karen what a awesome technique, thanks for sharing. Turned out wonderful. Good Luck! I hope we see you again!! Thank you for joining us at Scrapy Land. CLICK PIX FOR KAREN'S KREATIVE KARDS ON YOUTUBE! NEW VIDEOS POSTED EVERY MONDAY! Welcome to Karen's Kreative Kards! Everything You Need at Scrapbook.com! Click to see Deco Foil, Gina K and More! I love Lil' Inker Designs! What Else Can We Do With Our Dies? Spring Colors 4 Kids at Send A Smile 4 Kids! DISCLAIMER: Some of my blogposts and video descriptions contain affiliate links, which means that if you click on one of the product links and purchase something, I’ll receive a small commission. The price you pay is not affected when you use an affiliate link. This helps support my blog and YouTube channel and and allows me to reinvest in more products to share. Thank you for the support! All designs, text, and pictures on this blog are owned by Karen Hasheck. Original cards & scrapbook pages are posted for your enjoyment and inspiration only. Please do not copy my work for submission for publication or design contests. Feel free to use my design ideas for your own personal use, but try to change them up to make them your own. Thank you!